Ductless Split Systems afford you the option to not heat or cool unused rooms, such as guest bedrooms, without compromising the comfort of the rest of your home. There are many benefits of installing Ductless Split Systems in your home, potential energy and financial savings as well as not having to install additional ducts in your home. You may choose to install any number of individual room units in your home. We can install a single unit if you only need additional comfort in one room or we can install a multi-unit system and afford you the flexibility to control the temperature of every room in your home separately. We will wall mount and use a simple wiring process to wire each unit to an outdoor unit. The process is simple and because no ducts are used, it takes very little time. With a Split System in your Orlando area home, you have the ability to keep the rooms that you use most often at the precise temperature that you choose. You may want to maintain the temperature of your garage, or adjust the temperature of your bedroom while you sleep. Each room can have its own control unit if you choose, resulting in the greatest efficiency and comfort in your home while minimizing utility bills. Wall-mounted units have a Quiet Mode option, you will hardly know its running. Each unit is equipped with a removable, washable panel filter that essentially acts as an air purifier. It will remove the mold and dust from each room in your home. Each unit can even operate in Dry Mode and act as a dehumidifier, whether you choose to cool that room or not. Dry Mode can operate on a 24 hour timer. 9RLFW and 12RLFW are both Energy Star qualified heat pumps with SEER ratings of up to 23, so they provide both heating and cooling while keeping utility costs low. The filter is easily removed and washable. The only other maintenance this unit requires is occasionally wiping down the casing to keep it free of dust. Each unit can be adjusted with a standard wireless remote controller that comes equipped with a sleep timer. Each room can easily be controlled and adjusted, even after you have gone to sleep. When the system is turned on, the fan automatically begins adjusting the temperature of the room on “High” and adjusts downward as the room temperature approaches the set temperature. 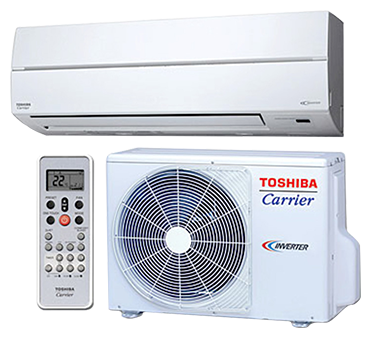 Contact us for more information about how a Ductless Split System can work for your Orlando area home. “The HVAC technician from Rainaldi was excellent and explained everything thoroughly while walking me through the process of what was going to happen next.” – Albert P.